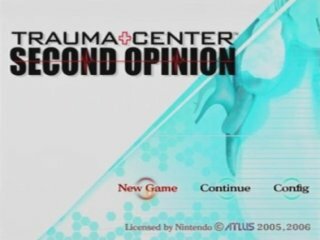 Released in November 2006, on the launch day of the Wii, sadists rejoiced as this remake of the DS game Trauma Center: Under the Knife let gamers continue inflicting grotesque bodily harm upon their victims treating patients, except with a Wiimote instead of a DS stylus. A new character, Nozomi Weaver, and new missions were added for the Wii release. The game again has the mysterious disease GUILT (Gangliated Utrophin Immuno Latency Toxin) threatening mankind, and it's up to Dr. Derek Stiles to prevent GUILT from spreading. Note: The in-game timer is not used because healing touch slows it down. Best single-segment time, normal mode 1:24:18 by 'szsk' on 2009-01-07. Best single-segment time, hard mode: 1:43:55 by Joshua 'InfinityX' Tate on 2008-04-11. Best 100% single-segment time, hard mode: 2:34:03 by 'szsk' on 2009-07-16. Single-segment normal mode: 1:24:18 by 'szsk'. After I complete surgery, it's possible to pick the next episode quickly by going back to the episode select screen. It's also possible to skip episodes without surgery by using the episode select screen. I turn autosave off to shorten the save time during each episode clear. Since healing touch slows down the game, I tried to use it only in the appropriate places without overusing it. During the Savat battle, I used a bug that lets you use your tools even when they break. To perform this glitch, you hold a, then press z while your tools are broken. When you press Z, your will be able to use your tools for a split second. During this split second, I can cut Savat's webs. Single-segment hard mode: 1:43:55 by Joshua Tate. This was done to the same criteria as my predecessor, Adam "Lucid Faia" Sweeney's run. I started the timer as soon as the "Now Loading" screen faded, and ended it at the end of the epilogue (when the word "skip" fades top denote moving to the credits), bringing the total time of the run to 1 hour, 45 minutes, 12 seconds, a 3 minute 55 second improvement over the current record, 1 hour, 49 minutes, 7 seconds. Single-segment 100% hard mode: 2:34:03 by 'szsk'. This run was motivated by the above thread. I minimized unnecessary actions as much as possible in order to achieve a time within three hours while collecting an XS rank in each stage. Basically, you cannot have a single miss to achieve XS rank. If you miss, then you have to start the stage from the beginning, and the time lost is around 1-2 minutes. Therefore, I tried my hardest not to miss. As a result, my movement is slower than a normal speedrun. Although this is a single-segment run, after I cleared the game I loaded my save data once in order to advance. Aside from this one instance, I did not load the game at all. I would like to thank Nate for converting my movie files for SDA and Mike for translating my Japanese comments to English.